二战中泰瑞纳斯组织了抵御部落突袭王城的战斗部队。 他甚至指挥了那场几乎毁灭了洛丹伦的战斗中的守卫部队，他的王国在这场战斗中濒临毁灭边缘，国王本人也差点被一个兽人杀死，所幸兽人被卫队长莫雷夫杀死。但最终，他们的牺牲并没有白费，联盟获得了胜利，消灭了绝大部分的部落，将剩余的兽人关押到集中营，由艾德拉斯·布莱克摩尔负责管理。兽人大酋长奥格瑞姆·毁灭之锤被泰瑞纳斯当做私人囚犯， was kept as the personal prisoner of Terenas, the human king fervently hoping that a treaty could be arranged with the orcish leader. Terenas thought that if the orcs could be kept pacified long enough, they ought to eventually lose their lust for conquest, and as such he pleaded to keep them interned instead of executing them. Doomhammer eventually escaped captivity and fled into hiding. Despite the end of the Second War, peace did not last long. 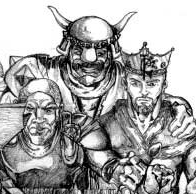 He and the other kings of the Alliance were present at the meeting in Nethergarde Keep. Later, he met with Thoras Trollbane, 穆拉丁·铜须, and Lord Daval Prestor and discussed the matter with Alterac and Perenolde. 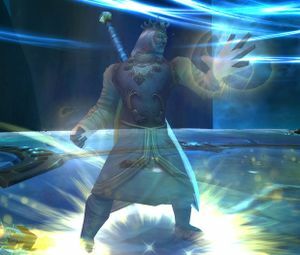 When it was discovered that the rift to the orc's home world was expanding, Terenas immediately decreed in conjunction with 瓦里安·乌瑞恩, who had assumed his rightful place on the throne of Stormwind, and the other kings to rally the Alliance army that would venture into Draenor in order to retrieve the artifacts stolen by the Horde and end the orcish threat for good. The Alliance Expedition led by 卡德加 and Turalyon undertook the Invasion of Draenor, eventually succeeding and and sealing the Dark Portal from the other side to prevent Draenor's destruction from destroying Azeroth as well. Some years later, the matter of what to do with the Kingdom of Alterac came up. Trollbane wanted to split the lands between Lordaeron and Stromgarde. However, King Genn Greymane supported Lord Perenolde's nephew Isiden's claim to the throne while Admiral Daelin Proudmoore of Kul Tiras was opposed to Gilnean influence in the region. Lord Prestor, who appeared to be a relative to the late Lord Perenolde, was one of Terenas's trusted advisors during this time, and Terenas began to arrange a marriage for Prestor to his young daughter Calia. Terenas even wished his own son was more like Prestor. Prestor was endorsed by most Alliance nations as the new king of Alterac, solving everyone's—and particularly Terenas's—political nightmare. This plan was scrapped, however, when Prestor suddenly disappeared. During the winter when Arthas's mount, Invincible, died, Terenas and Uther were off on a diplomatic mission in Stromgarde. Terenas was later present during a ceremony in Stormwind City, where Arthas became a paladin. He told him that he was proud of him that day, which confused Arthas as he was unsure if his father was ever proud of him until that day. When the political problems culminated, Terenas realized that the Alliance would crumble. The first ally to secede were the elves of Quel'Thalas, as they blamed the humans for not being able to save their burned forests. Terenas tactfully reminded them that it was the Alliance that saved them from being annihilated entirely. Gilneas then separated from the whole world behind the Greymane Wall and Thoras Trollbane proposed a mass execution of the orcs but Lordaeron refused to do so. The quarrels of the two friends ended when Stromgarde too seceded from the Alliance. In spite of these loses, many nations remained with Lordaeron and Uther, who considered him as a brother, alongside Alonsus Faol had helped him to rebuild Lordaeron and other kingdoms. Time wore on and Terenas grew more and more infirm, struggling to hold together the collapsing Alliance despite all of his pleas with the dissident nations of Gilneas, Stromgarde, and Quel'Thalas. Nonetheless, Terenas still had allies he could rely on, as the nations of Stormwind, Kul Tiras, Dalaran, and 铁炉堡 remained committed to the Alliance. In the meantime, his son, Arthas, became the prized protégé of Uther the Lightbringer and a paladin of the Silver Hand. The troubles began with the orcish uprisings through Arathi, as well as the Plague spreading from the North. Many of the Alliance representatives, especially the ones from Dalaran, were pleading for a quarantine. But Terenas refused, saying that the people of Lordaeron had suffered enough. The mysterious prophet unexpectedly materialized during a council of the Alliance, and pleaded with Terenas to make haste to Kalimdor or all would be lost. Terenas, however, paid no heed, thinking him little more than a madman. It was here that King Terenas sealed his fate. Weeks later, Terenas heard of Arthas's strange behavior, including the destruction of Stratholme and his excursion to Northrend. Terenas immediately ordered the troops recalled at Uther's request, but no word was heard from them for months. Finally, Prince Arthas returned, victorious over the evil he had faced in Northrend. All of Lordaeron's Capital City rejoiced in festival, celebrating the long-awaited return of their heroic prince. But something was amiss. As he knelt before his father, a dark voice flooded Arthas's thoughts. He rose up, drew his sword, and approached the throne. Taking his father by the throat, Arthas drove the dark runeblade Frostmourne through his heart. Thus did Terenas of the House of Menethil, King of Lordaeron, die at the hands of his own son—bringing an end to not only his reign, which had lasted for 50 years, but also to the Kingdom of Lordaeron itself. Terenas's ashes were kept in a magical urn, guarded by Uther the Lightbringer himself. Arthas, desiring the urn for his own ends, slew the great paladin, and discarded his father's ashes which were scattered by the winds near Andorhal. The inscription on Terenas's tomb. Here lies King Terenas Menethil II -- Last True King of Lordaeron. Great were his deeds -- long was his reign -- unthinkable was his death. "May the Father lie blameless for the deeds of the son. May the bloodied crown stay lost and forgotten." 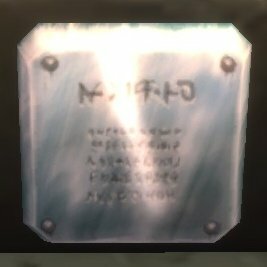 The plate containing this inscription is missing from the tomb during the Battle for the Undercity. The tomb was crafted by the ruined city's former citizens, who risked everything to ensure his memory would not be forgotten. Terenas holds his dead son's body. The soul of Terenas Menethil II speaks to the Lich King warning him that the combined might of the Alliance, the Horde, the Argent Crusade and the Knights of the Ebon Blade have finally fought their way to Icecrown Citadel itself to defeat him once and for all. Terenas's spirit appears in Icecrown Citadel during the battle against the Lich King. When players falls victim to the "Harvest Soul" spell, they are brought into Frostmourne itself, where they find Terenas struggling against the spirit warden of the sword. The player must aid Terenas in defeating it, at which point the blade becomes weakened enough for him to be able to return the player to the real fight. At 10%, the Lich King then kills the entire raid and prepares to raise them as his most powerful servants when Tirion Fordring, frozen for the entire fight, breaks free of his bonds and shatters Frostmourne with the Ashbringer. As the souls claimed by Frostmourne swirl around the Lich King, Terenas's spirit appears to resurrect the dead to finish off the immobilized master of the Scourge. 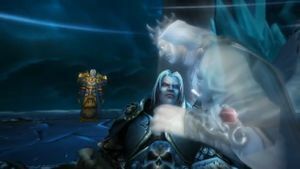 During the outro cinematic, Terenas remains at Arthas's side as he dies. Arthas lies supine, the shattered remnants of Frostmourne beside him. 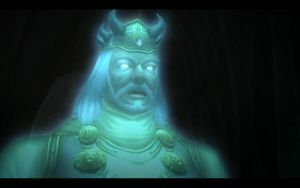 He stares as the ghost of Terenas Menethil materializes over him from the freed souls circling the area, and the characteristic blue glow dissipates from his eyes. Terenas kneels down, and cradles his son's head, neck and shoulder so they can properly look at each other. 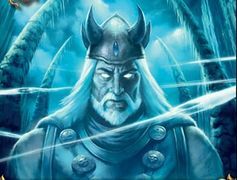 Arthas Menethil: Father? 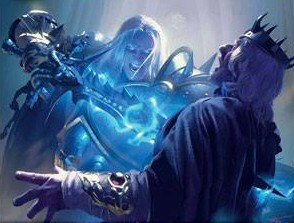 (With his last burst of energy, Arthas places a hand on his father's chest.) Is it... over? Terenas lays a comforting hand on Arthas's gauntlet as he answers. Arthas's eyes roll back, his hand falling from his father's to the ground. Terenas closes Arthas's eyes and just holds his boy as Tirion walks closer, just past the inner ring to the Menethils. As he next speaks, Terenas gently lays his son on the ground. Terenas stands, looking at Tirion as the paladin meets his gaze. Terenas's ghost and the swirling souls disappear, and Tirion shields his eyes from the blinding light. "I will summon my neighboring kings. These events concern us all." - to 安度因·洛萨, Tides of Darkness. "Noble countrymen, evil is upon us. Darkness has befallen our shores. Rise and slay thy enemies… strike, strike so others shall live. The meek shall not fade into the night… live my brethren, live." "I will not institute quarantine without proof of your claims, Ambassador. The people of Lordaeron have suffered enough without becoming prisoners in their own lands." - Warcraft III: Reign of Chaos. "I don't know who you are or what you believe, but this is not the time for rambling prophets! Our lands are beset by conflict, but it shall be we who decide how best to protect our people, not you!, now begone!" - to Medivh, Warcraft III: Reign of Chaos. "What is this? What are you doing, my son?" - Terenas Menethil's last words before his death. "No king rules forever, my son." - the last words spoken to 阿尔萨斯·米奈希尔 before his death. 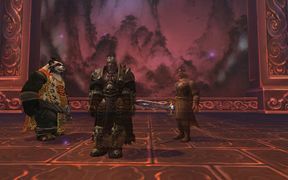 Terenas Menethil II narrates the opening cinematic to World of Warcraft: Wrath of the Lich King, reminding Arthas of his duty as the heir to the throne of Lordaeron. The soul of Terenas Menethil II speaks to the Lich King in the trailer for patch 3.3: Fall of the Lich King. He warns the Lich King that the combined might of the Alliance, the Horde, the Argent Crusade and the Knights of the Ebon Blade have finally fought their way to Icecrown Citadel itself to defeat him once and for all. Spirit of Terenas Menethil: Can you feel it, my son, closing in all around you? The Light's justice has been awakened. The sins of the past have finally caught up to you. You will be called to account for all the atrocities you've committed, the unspeakable horrors you've let loose upon this world, and the dark, ancient powers you've enslaved. Though my soul was one of the first to be devoured by your evil, there are thousands more bound within this blade, and they cry out for release. Look now to your defenses, my son, for the champions of justice gather at your gates! The Lich King: Let them come. Frostmourne hungers. His eyes' color was blue and green swirled together. Terenas enjoyed Fras Siabi's tobacco. Warcraft III level designer David Fried acknowledged Medivh's warning to Terenas was extremely vague and that he should've mentioned the Burning Legion and orcs as well. Visions of Arthas and Terenas briefly appear in Quest:Gods and Monsters, a story told by Lorewalker Cho. 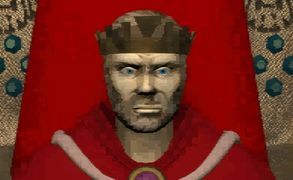 In Warcraft III: Reign of Chaos, Uther tells Arthas that Terenas ruled Lordaeron for seventy years. In Arthas: Rise of the Lich King, this was changed to fifty years. His quote "No king rules forever" echoes Yogg-Saron's "He will learn... no king rules forever; only death is eternal!" 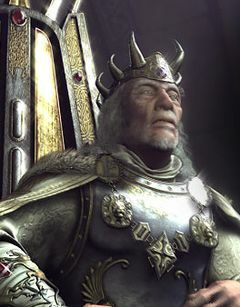 Terenas is the narrator of Wrath of the Lich King intro cinematic and is voiced by Earl Boen, who also voiced Terenas in his in-game appearances in Icecrown Citadel. Ted Whitney, who voiced Terenas in Warcraft III, passed away a short time after finishing his work. King Terenas Menethil's Silver Coin can be fished from the Dalaran Fountain and the Royal Scepter of Terenas II drops from the Lich King. A version of Terenas Menethil existed in a timeway where history turned out completely different and which was entered by Thrall during the Cataclysm era. A statue of Terenas, recovered in the Wetlands, depicted him as "a young, long-haired paladin with hammer upraised." When the Horde attacked the 洛丹伦（首都）, Terenas reluctantly picked up a fallen sword with which to defend himself, but he was "painfully aware that he was no fighter". 《魔兽世界：编年史第二卷》 also clearly states that he was no warrior. He couldn't have trained as a paladin until after the 第二次大战, and by then he was far from young. That statue may have been intended as a depiction of Arthas, or a heavily idealized version of Terenas. ↑ Knaak, Richard A.. 《巨龙时代》, 82. ISBN 978-0-6710-4152-6. ↑ Rosenberg, Aaron; Christie Golden. 《穿越黑暗之门》, 21. ISBN 978-1-4165-5086-0. ↑ Knaak, Richard A.. 《巨龙时代》, 24. ISBN 978-0-6710-4152-6. ↑ Warcraft III Cinematics Disc (WarCraft 3 Cinematics Study, Quote: As commented on the cinematic DVD, the voice actor for King Terenas sadly died a short time after voicing his part. ).